The best data recovery software free on the Web right now is the application that does the most for you. And what you – like most users – need data recovery to do is get back accidentally deleted files. Fortunately, the price of such services has come down considerably. In fact, the most feature-packed data recovery software, Boomerang Data Recovery, offers a free version for both PC and Mac. What can data software free, in the form of Boomerang, do for you? The answer might surprise you. In addition to ‘simple’ file recovery, this new file recovery software can recover formatted disks. This means that, even if you have reformatted a drive while forgetting to backup some important files, you can still get them back, even after the fact. And, assuming there has not been a complex reformatting or “zero fill” of the hard drive, you can even recover files that exist on disks that have been formatted more than once. This puts all of your files, even old ones, which you previously thought were ‘lost’ to the sands of time, back in your hands. We distill our lives in our collections of photos. Perhaps nothing is more important to some of us. Sadly, with many different file organizational schemes in use by different camera makers, it is altogether too easy to accidentally delete some photos you would truly like to keep. 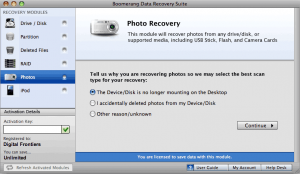 Fortunately, Boomerang can recover deleted photos through its Mac-like interface. The application even allows for image preview, so you can select which images to recover. Yes, in this day and age, data recovery software free can even restore files from your RAID array. The complexity of RAID disks is by no means too much for Boomerang. This application features the pioneering ability to re-assemble and recover complete RAID volumes, allowing users to get everything on their array back, easily – and without exhaustive IT hours and high hourly costs, to boot. iPods are convenient music players, but if you have ever dropped one and broken its screen, you know how frightening it can be to think that you might be able to recover all the files stored on it. Boomerang can tackle even this problem, with easy iPod file recovery built in. This feature even lets you transfer your DRM content to your new device.